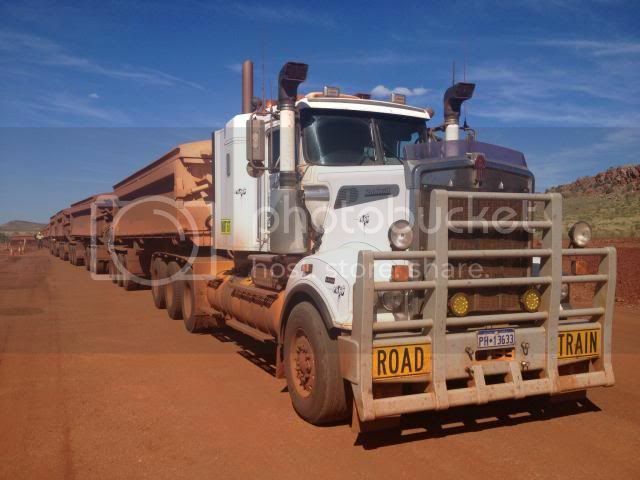 At the end of last year a mate of mine got a new job driving roadtrains in Port Hedland Western Australia. As work has been very quiet.I decided i needed to do something else so in March this year i started at the same company. They are replacing the 650s with new trucks all the time so we will get a new truck soon hopefully. On the 2nd picture (all great shots. Don't loose that phone), what's the air intake behind the bunk? Notice you guys pack a LOT of fuel. How many gallons or liters? How long does loading/unloading take? 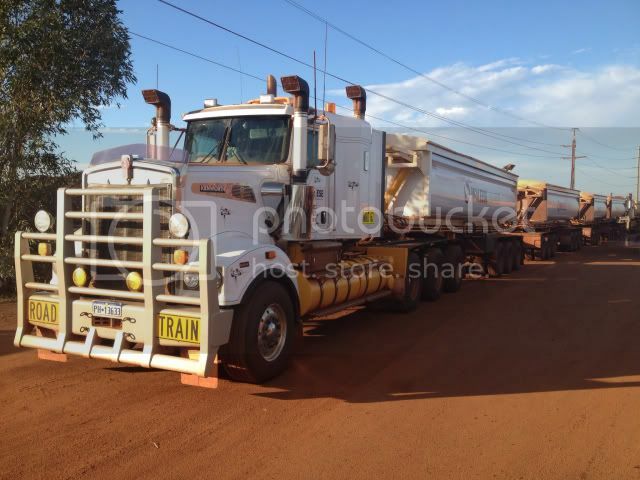 Much time waiting on other trucks? What's the cruising speed? 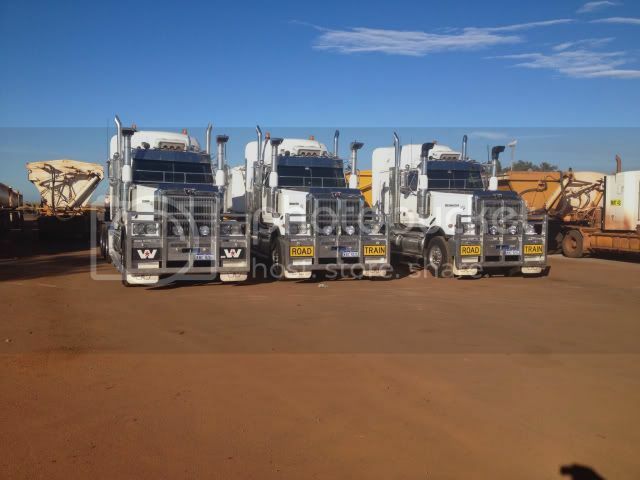 Is the haul road private in some areas or all public? Is it fairly flat, rolling, or steep grades? If a guy was young again & loves trucks, would this be the place to be or what! Congrats on the new job! And wow those sets are massive! Are the third and fourth dumps a b-double set? That's how a lot of them I have seen in pictures appear to be set up. The air intake behind the cabin has oil coolers for the diffs in it. They run the oil lines in the bottom of the intake to the coolers and back out. We carry about 1200lts of fuel and use about 700lts a shift. 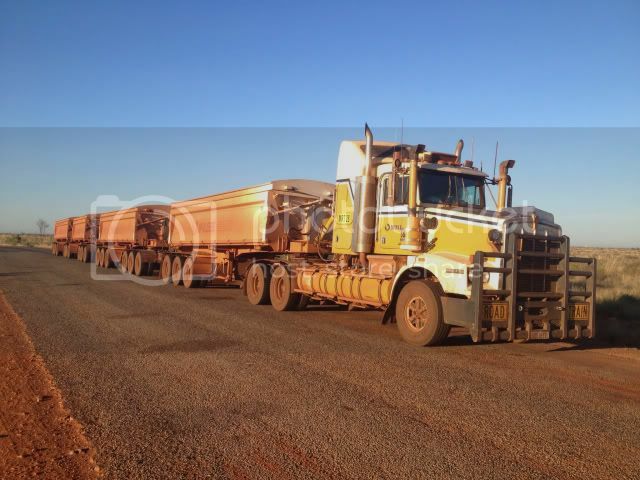 They use 2 WA 500 loaders to load, so it only takes about 15mins to load, we get times when there is a line up of trucks so you can wait up to an hour. We cruise along at 100kmh as the roads are fairly flat where we run. The mine roads are private from the main rd into the mine. Thank you. Yes it is a b-double at the rear. We run them at the back cos they track better. Thanks for the info. Appreciate that a lot. Never though about coolers for the final drives, but with hot-outside & constant serious horsepower, can totally understand that need. Love learning that old guys are allowed to work there. If Willy would go along, I'd try to get a physical fudged up & head down there. My hearing is badly compromised (just high pitch. hear deep bass diesel real good) & I'm too cheap to spring for a hearing aid, but gonna bet there ain't much to listen to out there anyway. Might hafta do some real good PR work to convince my bride of 47 years I should go do that.